Time flies like B-25's. Another Kodachrome from the Early Days of Shorpy, enlarged and re-restored. October 1942. 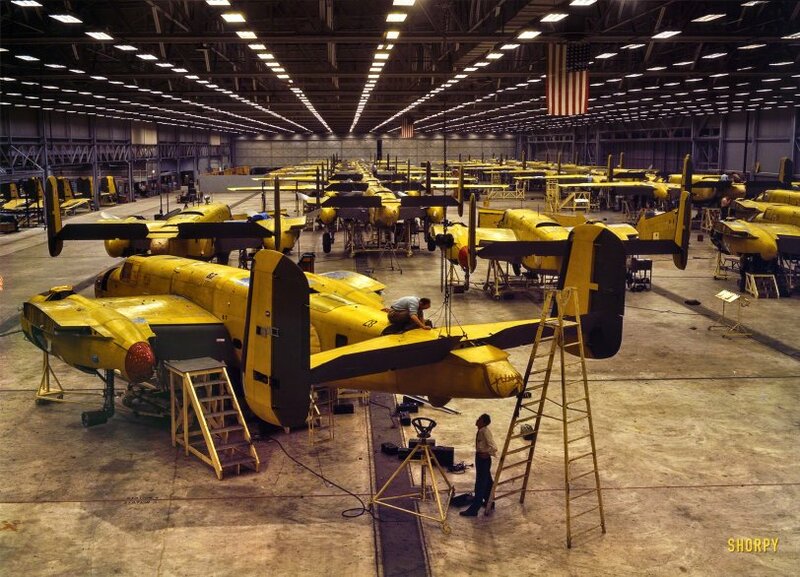 "B-25 bomber assembly hall, North American Aviation, Kansas City." Kodachrome transparency by Alfred Palmer for the OWI. View full size. Submitted by gtv625 on Fri, 05/05/2017 - 2:16pm. Here there is an aerial photo showing the plant and airport. The plant was immediately adjacent to the NW corner of the airport. Submitted by Anonymous Tipster on Tue, 11/18/2008 - 6:54pm. It was a nasty zinc chromate concoction meant to prevent corrosion and also allow the top coat of paint to adhere better. Worn paint revealed the primer underneath in contemporary pictures. Eventually it was realised the average wartime airframe didn't last long enough in service to allow corrosion to begin and the primer was dropped, a cost and weight saving. Submitted by Mike_G on Tue, 11/18/2008 - 4:21pm. Submitted by Jack on Tue, 11/18/2008 - 3:26pm. My mother-in-law worked at the Fairfax plant installing bombsights in B-25's. She would taxi the aircraft out herself once the bombsight was installed for the ferry pilots to deliver them. She often talked about one that had the name "Mickey" painted on it. I was wondering if anyone knew anything about this aircraft. Any news would be appreciated. Thanks. Submitted by george.todd on Sat, 08/30/2008 - 1:51pm. I'm pretty sure that Fairfax plant was in Kansas City, Missouri, not Kansas. I live withing walking distance of the plant and I'm on my side of the state line. Those B-25 bombers were always Bushwhackers, built by the ancestors of Captain Quantrill. The B-25 Bomber ain't no jayhawker. Submitted by Anonymous Tipster on Sun, 05/18/2008 - 7:51am. I had no idea that planes would have been painted yellow at this stage! You always see B&W photos so I just assumed they were still just bare metal. Submitted by Anonymous Tipster on Mon, 02/18/2008 - 1:40am. The Fairfax B-25 plant was NW of the tee intersection of Fairfax Trafficway and what's now Kindleberger Road in Kansas City, KS. The photo is in what was the final assembly high bay near that intersection and facing north. The plant was bought by GM after the war and used for auto production until it closed for good in the mid 80s and then torn down. The old Fairfax Airport next door was bought out about that time, closed and a new GM-Fairfax plant built on the airport site to replace the old auto plant. The B-25 plant site is now a fenced off, vacant, scrubby field. The only facility remains are the parking lot with what's left of the main entrance drive. You've got a great photo blog. This photo is my new wallpaper, I hope that's okay. Submitted by Mark on Tue, 01/29/2008 - 11:31am. These appear to be in place to protect the metal while the wing root and nacelle are lifted into place or while the a/c is being pushed about, at least until the wheels are installed. Perhaps a tow bar is attached to the nose gear strut at that point. Then again, they may be giant hickies. Submitted by Brent on Tue, 01/29/2008 - 2:44am. Interesting. The appear to be temporary rather than permanent, held on by bungees attached to the incomplete wing assemblies. Interestingly they are only found on two of the aircraft; the plane nearest to us where the worker is at the tail assembly, and the plane ahead of it to the right. Neither of these aircraft has wheels or propellers. Most of the other aircraft in the assembly area do. Trouble is that the plane to the right of the second plane with the caps doesn't have a cap but also doesn't seem to have either props or wheels. I'm just guessing here but I think my reasoning is good. 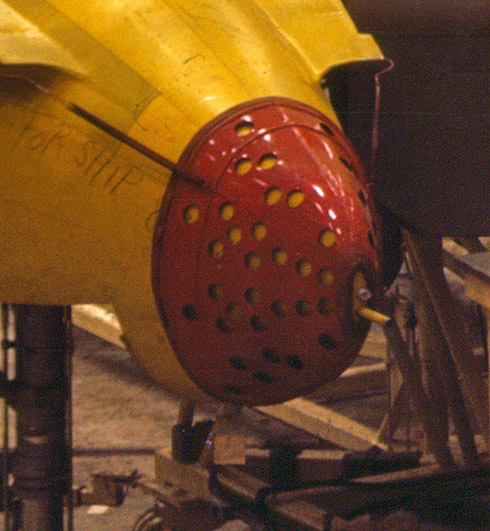 It seems obvious that these nacelle caps are used to indicate that some step in the assembly process, probably related to the engines or the hydraulics of the landing gear, hasn't been completed and tested yet and so long as the red cap is remains on the nacelle the aircraft can't go further in the assembly process. But as I say this is just a guess. Submitted by Arch Stanton on Tue, 01/29/2008 - 12:58am. I spent a lot of years in aviation, working on everything from light aircraft to WWII war birds. I even worked in a factory for a while on Swearingen's final assembly line in San Antonio. Later, I went on to fly professionally ending my career with about about 2700 hours, many of them in various types of WWII vintage aircraft. I was wondering if anybody knows what the red covers are on the ends of the nacelles [below]. I have never seen anything like this before. Submitted by Jake on Tue, 01/01/2008 - 2:53pm. Those are B-25 d's at the Faifax assembly plant. My dad built em there. He's still kickin and saw the photo. Brought back a lot of memories. He says thanks for the great pic. Submitted by Gary Lewis on Sun, 12/30/2007 - 12:13am. This is an early model B-25, probably a D model due to the aft location of the upper gun turret and the lack of a tail gunner position. Submitted by Anonymous Tipster on Thu, 12/06/2007 - 11:05pm. The plane is a B-25...the b26 has a different tail configuration and the b-24 looks similar but has 4 engines. Submitted by Anonymous Tipster on Mon, 09/24/2007 - 4:04pm. Just to confuse the issue there were A-26s too. Twin engine ship built by Douglas. Above comments very interesting Some knowlegable,some not. Submitted by Charlie on Tue, 06/19/2007 - 9:22pm. I flew this plane (B-25) in the South Pacific. What a beauty it was. It was a medium bomber that was turned into a strafer with 12 50's firing forward, very lethal. We flew tree top missions on land and mast top missions when hitting ships. Submitted by Anonymous Tipster on Fri, 05/25/2007 - 1:00pm. This is definitely a B-25 Mitchell, not a B-24 Liberator, and not a B-26 Marauder. I have shot B-25s in the past, so I have personal experience with this plane. This is the same type of plane that Jimmy Doolittle flew off of the deck of the USS Hornet in 1942 to bomb Tokyo during WWII. Submitted by Anonymous Tipster on Sat, 05/05/2007 - 10:11pm. Submitted by Anonymous Tipster on Tue, 04/03/2007 - 10:27pm. This is definitely a picture of a B-25, also known as a Billy Mitchell. I flew as a passenger in one of them in 1948 on my way to an Air Force tech school to become a radio operator. It had to be the noisiest ride ever in a medium bomber, but it was fast. Submitted by Anonymous Tipster on Tue, 04/03/2007 - 9:57pm. You're thinking of the B-24 4 engine "Liberator" bomber which was cousin to the B-17 "Flying Fortress" that did carpet bombing before the advent of the B-29 "Super Fortress". The B-26 was a twin engine light bomber made by Martin Aircraft Co, and in the same category with the B-25 "Mitchell". Submitted by Dave on Tue, 04/03/2007 - 5:56pm. At 9:49 a.m. on Saturday July 28, 1945, a B-25 Mitchell bomber flying in a thick fog accidentally crashed into the north side of the Empire State Building between the 79th and 80th floors, where the offices of the National Catholic Welfare Council were located. One engine shot through the side opposite the impact and another plummeted down an elevator shaft. The fire was extinguished in 40 minutes. Fourteen people were killed. Elevator operator Betty Lou Oliver survived a plunge of 75 stories inside an elevator, which still stands as the Guinness World Record for the longest survived elevator fall. Despite the damage and loss of life, the building was open for business on many floors on the following Monday. Submitted by Anonymous Tipster on Tue, 04/03/2007 - 5:54pm. Good plane; wasn't it a B-25 that hit the Empire State building late in the war years?? Submitted by Dave on Tue, 04/03/2007 - 5:42pm. The B25 was a twin-engine medium bomber. I have some more pictures of the assembly line to post later in the week. Submitted by Anonymous Tipster on Tue, 04/03/2007 - 5:28pm. That was not a B25 (a four engine heavy bomber) The plane in the photo appears to be the twin engined B26, a much faster, lighter "attack bomber" for lower level pin-point missions rather than the carpet bombing that actually the larger B-17's and B25's were best suited for. Submitted by Anonymous Tipster on Tue, 04/03/2007 - 1:09pm. Not many of you know about WW II planes, first the rest of the outboard wings haven't bee assembled and put on yet, next the yellow color is the primer paint, the finished coat would be olive drab, camouflage or desert colors light & dark sand depending what theater of war the plane would be sent to. Submitted by Dave on Tue, 04/03/2007 - 12:56pm. They are mostly hidden by the planes. I see at least 19 people. The photographer was Alfred Palmer, who took hundreds of pictures like this for the Office of War Information. Submitted by Anonymous Tipster on Tue, 04/03/2007 - 10:09am. Might be that a security guard on night duty took the picture. Submitted by Anonymous Tipster on Tue, 04/03/2007 - 8:21am. Not exactly a stealth bomber, eh? Submitted by Anonymous Tipster on Mon, 03/26/2007 - 12:45pm. I never realized how small a B-25 was. That thing's tiny. Also, where are all the people?